Hallo to all my LJ friends. How is your weekend? Mine is fine so far ... aaand two weeks off work now :) I hope to get done some necessary work at home but to find time for writing, reading, watching some movies too. Casey was sitting alone at one of the small tables of the diner, a salad with a baguette in front of him, the laptop opened. He went over his notes, some general first impressions of the Con, some talks he had had with visitors but his main focus was directed to Zeke. Of course. Herrington was his hometown and most people would still remember him. He had had his rep, even before Mary Beth had happened. But this turned out to be more difficult than expected, this 'new' Zeke got deeper under his skip than he was willing to admit. Was the hell was going on with him? He was not an awkward Highschool boy anymore, he was grown up, he was successful in his job … and he had had a longer relationship with another guy. It was over though, they did fight more and more often lately, John wanted him to stop to work so much. And when Casey told him, that he would go to San Diego for two weeks he had asked him to make a decision: his job or his life with John. He didn't need to think about the answer … all he did hope for was that John had already left the apartment when he would come back next week. When someone dropped down onto the chair opposite him he groaned inwardly. Couldn't he look for a seat somewhere else? The last he was interested in was some small-talk with a stranger. The voice almost made him jump. He looked up and there he was. Still wearing this deep-blue shirt with the stripes and his smile was wide and genuine. “Hey, Zeke,” Casey said, fighting down his uneasiness. This made him smile. Most wanted star? Well, at least his fans would agree with this, and he had a lot of them. So often he was asked for autographs and photos and unlike the one or the other 'big name' he was always nice to them, he laughed and joked … like the Zeke he had known at Highschool. Maybe he hadn't changed that much. “It doesn't look like you have much time,” Casey finally said. „Kinda strange, though,“ Zeke said. A waitress stopped at their table with a coffeepot. “Can I refill,” she asked Casey and he nodded. Then she turned around to Zeke, stopped shortly, but finally she seemed to remember her job. “That's okay,” Zeke assured her. She left and Casey looked amused. 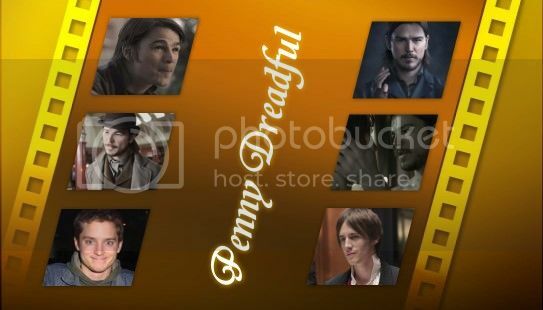 “Penny Dreadful, oh yeah. I actually got the role by a fluke. It was at one of these parties where everyone pretends to have a lot of fun, you have a drink or two and make small-talk with people you don't even know. Show business. It's not that I'm crazy about it, but sometimes I need to make my agent happy and play along. Casey laughed. Yes, he did know him. Despite of distance, fame … and Reeve Carney. The old familiarity was still there. Only now he noticed how much he had missed all this. He was not the lonely geek from Highschool anymore but no one had ever been as close to him as Zeke. Maybe it was not a surprise that his relationship with John hadn't last. He had probably never loved him with all his heart, had used his job to keep him on distance. Maybe it was not only John's fault that they finally did break up. Then Casey shook off every thought about John, about his job, about Reeve and Comic Con. All what counted was that Zeke was back. Time seemed to fly. It was the waitress who finally interrupted their chatting and laughing when she came back with Zeke's burger and fries. “Enjoy your meal,” she said. Then she seemed to hesitate, unsure if she didn't overstep a line. She licked her lips flutteringly, suddenly looking slightly abashed. Zeke smiled his most seductive smile and she blushed. “What's your name,” he asked the waitress. Zeke chuckled slightly and wrote: For Penny, the nicest waitress of the Star's Diner. Zeke aka Ethan. He added the drawing of a little heart, then he pushed the paper over to her. “Oh, thank you,” she murmured almost breathless. It was then that she noticed two other guests sitting at a table nearby, looking over to her. She sighed slightly. “It was nice to meet you, Penny,” Zeke said and winked while taking a first bite of his burger. Ui, so late with saying thank you for reading and your nice comment. I'm glad you do like this story ... there is more ... just in case you are in the mood for it ;) No need to hurry, though.